You want to create videos for your customers, but it never seems like there's enough time to get started. Many people and organizations have faced the same demands, including the need to help customers succeed. The truth is, it's not your fault that you don't already have a video library full of content—the implementation is simply broken. What you need is a better way to get started. 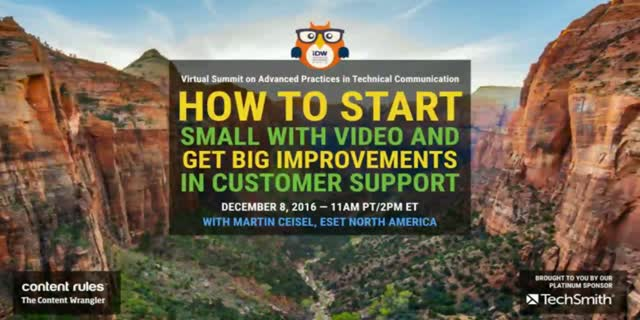 Join Scott Abel, The Content Wrangler, and his special guest, Martin Ceisel, Technical Writer for ESET North America, for this free, one-hour webinar. In this webinar, Martin will share the lessons those in the ESET Knowledgebase have learned while implementing video over the last five years. Martin will share some tips on how you can get your stream of video content up and running in less time than you think, including how his company's initial plan to tackle the top issues with video has them on pace to surpass one million views by the end of 2016. Attendees will learn about some top video best practices; tips and techniques for enhancing “traditional documentation” with video; the case for doing (more) video; and how video can start a conversation with your customers.